The Lean UX Meetup strikes gold again! The latest session featured Courtney Hemphill [@chemphill] of CarbonFive talking about Mixing Lean UX & Agile Development. Her talk was well-structured, easy to follow and filled with ideas to take home and start doing immediately. 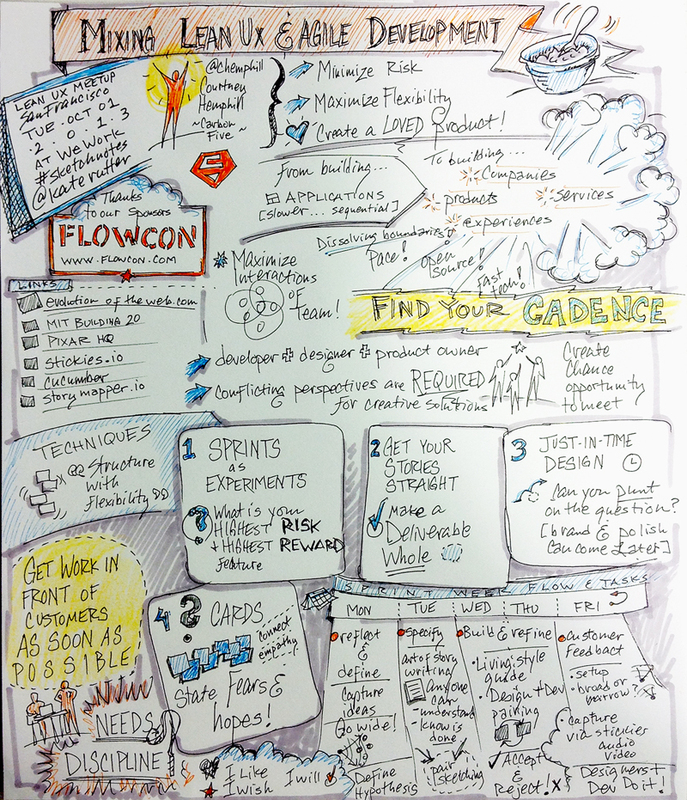 The flow of the sprint week was especially interesting, as I’ve seen other organizations use this model and it seems to be a solid approach for finally connecting the design and development efforts in lean teams. Here are the sketchnotes I took at the meetup. Sketchnotes for Lean UX SF Meetup on Mixing Lean UX & Agile Development by Courtney Hemphill. If you like what you see, check out your local Lean UX Meetup group. The Lean UX SF group has great events.